What is Cisco Hybrid Maintenance? Cisco gives Free Software Updates! 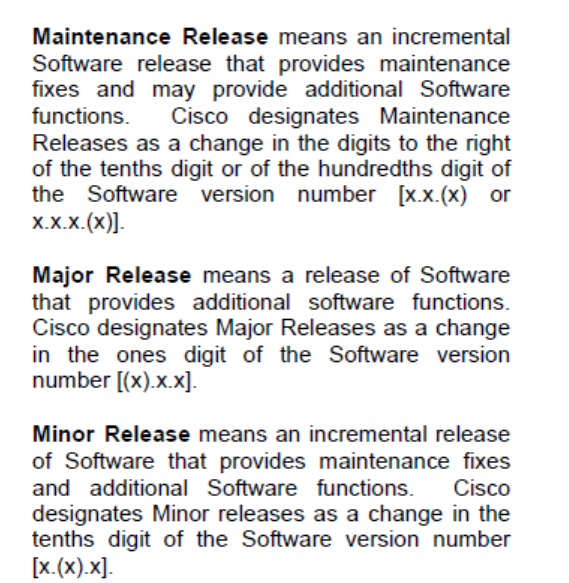 Cisco has multiple "Free Update Policies"
What is Cisco End of Software Maintenance (EoSW)? The purpose of this guide is to provide helpful information to owners of Cisco infrastructure considering Hybrid Maintenance, a Smart Net alternative, or Third Party Maintenance (TPM) on Cisco devices. Cisco's software policies support our recommendation for Hybrid Maintenance. Smart Net is a valuable and excellent service. We recommend Smart Net for devices that REQUIRE Smart Net to legally obtain software updates. Many Cisco devices are entitled to Free Software Updates - Cisco offers Free Software Updates on many devices with LAN Base & IP Base Feature Sets. Many Cisco devices no longer receive software updates - Many Cisco devices are End of Software Maintenance (EoSW). 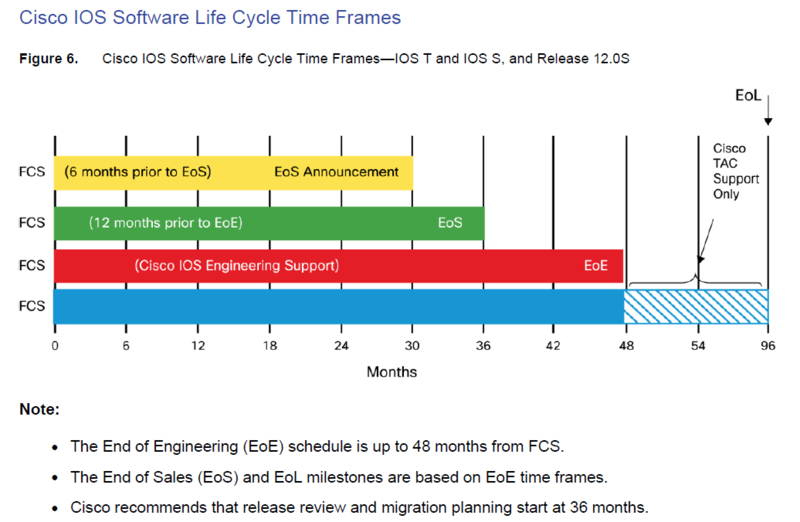 Typically after 4 years, and 4 years before End of Support (EOS), Cisco many times no longer develops software updates. Cisco devices entitled to Free Software Updates, and/or EoSW, we recommend using a qualified TPM to support these devices at a significant savings. What is Cisco Smart Net Maintenance? Cisco Smart Net Maintenance is an award winning maintenance solution providing support for Cisco infrastructure provided directly by Cisco Systems, Inc. the OEM (Original Equipment Manufacturer). What is Third Party Maintenance (TPM)? Because TPMs are focused on servicing customers (rather than selling hardware), they’re usually more responsive and able to offer faster access to advanced problem-solving support. Customers can expect case management to be more personalized with an experienced technician as their first point of contact. Their depth of knowledge is readily accessible, and research shows that a majority of companies switching to TPMs are quite happy. A vast majority of contracts that go from an OEM to a TPM stick with a third party maintainer permanently. OEMs often recommend upgrading perfectly functioning hardware assets as the warranty nears expiration. If you don’t, it means an expensive post-warranty maintenance contract and eventually a diminished or end to OEM support. But if you have an aging and stable infrastructure or you’re running legacy software to maximize your ROI, you might prefer to keep your existing infrastructure. With a TPM, you can extend the life of your equipment and continue to service and maintain it well after it’s deemed end of service by the manufacturer. Many organizations utilize equipment from multiple vendors and carry several OEM agreements. Each incurs overhead, requiring additional time (and paperwork) to juggle the contracts. With a TPM, companies can receive support for multiple manufacturers — all in one contract. Consolidating services allows you to gain efficiencies, save the hassle of dealing with multiple vendors, and rely on predictable costs. It also alleviates issues of finger pointing that can occur with multiple service providers. TPMs are able to provide an array of services, allowing you to tailor maintenance packages to your specific needs, rather than a one-size-fits-all approach. This flexible approach allows you to eliminate unnecessary services and puts you in the driver’s seat when it comes to choosing solutions that best match your requirements and budget. TPMs can easily customize solutions—from making simple contract changes to offering flexible lengths of service or coterminous contracts. This aligns all of your agreements to one common expiration date. The OEM business model relies heavily on developing and selling new equipment, so they guide customers toward technology refreshes rather than extending the asset lifecycle of those devices. Because of this, OEMs often increase the cost of after-warranty maintenance services year over year, even ending support for products before end of life. This can lead to costly and unnecessary upgrades for companies. With a TPM, you can extend the life of your system through maintenance and support at a much lower price point. The savings can be significant, often saving clients 60% off OEM support list prices. Deciding whether to stay with an OEM, switch to a TPM, or engage in a hybrid approach is an important decision. Working with a member of the Service Industry Association (SIA) will ensure that you are partnering with a quality provider. Just because third party maintenance costs less doesn’t mean you get less—although it’s important to use a premium-quality provider (more on that further below). Cisco Hybrid Maintenance is a "strategic blend" of Smart Net Maintenance & Tredent’s TDS-NetSupport. Managing a Cisco powered network, you know this all too well that Smart Net can be expensive. But you need access to those software updates!! Of course TAC and hardware replacement is great, but you're really paying high prices for Software Updates. We've heard it from customers hundreds of times. Cisco emphasizes the value of software updates as a major factor important to buying Smart Net. Further on in the study there is another common phrase related to SMARTnet that has a lot of Cisco users confused about what software updates actually are. We will clear this up in the next section with Cisco documentation but to give you something to think about before we get there. 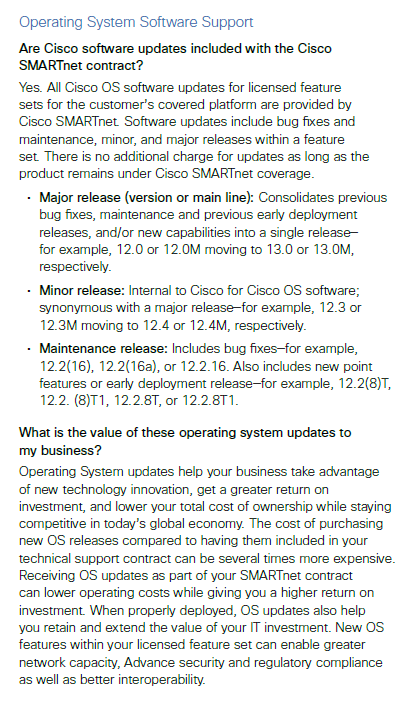 In the below graphic from Cisco, the document Cisco SMARTnet Service Overview emphasizes the value of Software Updates when buying Smart Net. Cisco puts a lot of value on software updates when advocating the purchase of Smart Net. Cisco heavily markets the value of software updates that come with SMARTnet and that value is justified by Cisco in the resulting high cost of Smart Net. “Updates” includes ALL "releases" within the same feature set. "Update" includes Major, Minor and Maintenance releases. Upgrades and Updates are very different. To move from one “feature set” to another would be considered an “Upgrade”. 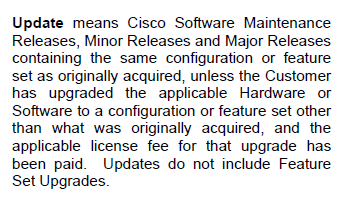 An “Upgrade” to a higher feature set is a separately licensed fee to all Cisco users whether the device has SMARTnet or not. Guess What?? Cisco provides FREE Software Updates! In 2009, in response to the competition offering Free Software Updates on switches, Cisco began offering Free Software Updates on many devices for the LAN Lite, LAN Base, IP Lite and IP Base Feature sets. The announcement can be found on Cisco’s web site here- Cisco devices entitled to Free Software updates. When a device is entitled to Free Software Updates, we believe Smart Net is not a fiscally responsible choice vs. a qualified TPM solution like Tredent’s TDS-NetSupport. We recommend considering Hybrid Maintenance on all devices entitled to Free Software Updates under this Cisco Policy. As of April 2019, Tredent has identified 222 Cisco devices that are entitled to Free Software Updates. Most Cisco owners are unaware that many Cisco devices stop receiving software updates 4 years after the First Customer Release (FCS) of the product. Cisco has a name for this date, "End of software maintenance releases date." “The last date that Cisco Engineering may release any final software maintenance releases or bug fixes. After the EoSW date Cisco will no longer provide software updates for a particular device. In the following graphics taken from Cisco’s web site you can see that Cisco is no longer providing software updates after year 4 (48 months). You can also see very clearly that from months 48-96 Cisco is providing “Cisco TAC Support Only” for devices past the EoSW date. Cisco continues to recommend Smart Net for devices after the EoSW date up till the End of Support at month 96. The image below is a highlighted snapshot of a typical Cisco End of Sale Announcement. Take notice of the 4-year difference from EoSW to Last Date of Support. 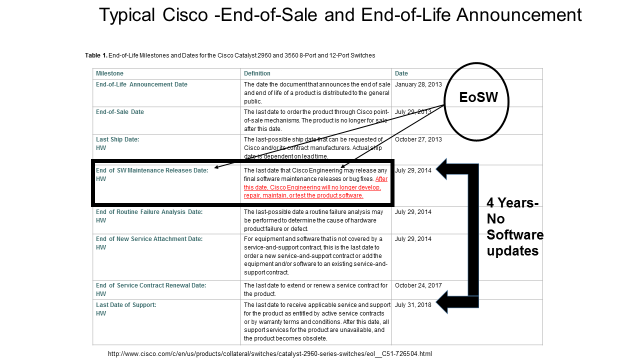 EoSW is an important milestone when considering maintenance options for Cisco equipment. After the EoSW date, Cisco is not providing the full service value of SMARTnet and SMARTnet is not a fiscally responsible choice. We recommend TPM on most devices past their EoSW date. Customers considering Hybrid Maintenance options should be aware of the Cisco Policy relating to Security Vulnerability. Customers with service contracts receive incident response assistance for any incident in which a Cisco product plays a significant role, regardless of whether there is an identified problem with a Cisco product. All customers, regardless of contract status, receive free incident response assistance, similar to that offered to contract customers, for any incident that involves a known or reasonably suspected security vulnerability in a Cisco product. Cisco reserves the right to determine the type and degree of assistance it may offer in connection with any incident and to withdraw from any incident at any time. Cisco may offer customers incident response services free of charge. Cisco may give special consideration to security incidents that involve actual or potential threats to persons, property, or the Internet as well as requests from law enforcement agencies or formal incident response teams. PSIRT will investigate and disclose vulnerabilities in Cisco products and services from the date of First Commercial Shipment (FCS) to the Last Day of Support. Cisco customers with service contracts that entitle them to regular software updates should obtain security fixes through their usual update channels, generally from the Cisco website. Cisco recommends contacting the TAC only with specific and imminent problems or questions. "As a special customer service, and to improve the overall security of the Internet, Cisco may offer customers free software updates to address high-severity security problems. The decision to provide free software updates is made on a case-by-case basis. Refer to the Cisco security publication for details. Free software updates will typically be limited to Cisco Security Advisories. If Cisco has offered a free software update to address a specific issue, non-contract customers who are eligible for the update may obtain it by contacting the Cisco TAC using any of the means described in the General Security-Related Queries section of this document. To verify their entitlement, individuals who contact the TAC should have available the URL of the Cisco document that is offering the update. After the End of Sale, the availability of security fixes provided by Engineering is defined in the product's End of Sale bulletin. (See the End-of-Life Policy for details.) The End of Sale Bulletin may define one or more of the following milestones." The End of SW Maintenance milestone identifies the last date Cisco may release a software maintenance release that could include security fixes. The End of Engineering Support for the Cisco TAC milestone is the last date that Cisco Engineering may consider the repair and support of confirmed hardware or software defects for a product. The End of Security and Vulnerability Fixes milestone identifies the last date that Cisco may provide support for network-impacting security vulnerabilities. Note: If the End of Security and Vulnerability Fixes milestone is not defined, the End of SW Maintenance and End of Engineering Support milestones will determine the last date Cisco Engineering will provide fixes. All aspects of this process are subject to change without notice and on a case-by-case basis. No particular level of response is guaranteed for any specific issue or class of issues. Cisco does a great job with Smart Net and some devices should ALWAYS have a Smart Net contract. Send your list of Cisco devices to get our Cisco Hybrid Maintenance recommendations. Knowledge of devices that are entitled to Free Software Updates, EoSW and EOL. TDS strongly recommends a Hybrid Strategy to Cisco Maintenance. When software updates are FREE, or are no longer available on specific devices, use a Qualified TPM to support these devices. Hybrid Maintenance is a strategic blend of OEM Maintenance and TPM such as Tredent’s TDS-NetSupport. It is a smart strategy of putting the most fiscally responsible coverage on each device based on the availability or non-availability of Cisco Software Updates.